D2H: Good News or Bad News? 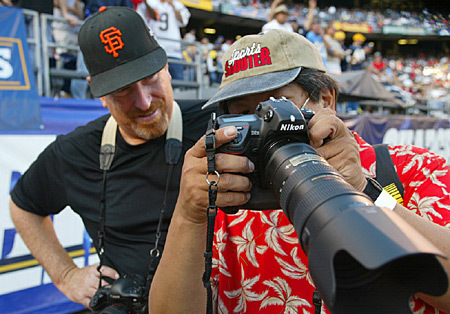 Robert Beck, left, gets a Nikon D2H lesson from Ronal Taniwaki. It's currently the Ying and Yang of digital photography. If camera technology were on stage it might be the "Odd Couple's" Felix Unger and Oscar Madison --- opposites in one body. Or in the words of freelance photographer Denis Poroy: "I've never seen a camera with so many differing opinions about it!" Since the early days of beta testing opinions have widely varied on the performance of the D2H, Nikon's new professional digital SLR, with photographers in one breath saying "the D2H looks, feels and shoots great" and in the next adding "but one of the first times I used the camera I felt like I'd been punched in the stomach …"
The concerns among photographers centers on the D2H's performance at high ISO settings as well as a perceived lack of sharpness in the camera-generated JPEG's. Are these problems real? Or just the usual grumbling of photographers who are hard to please and never 100% satisfied? "After hearing so much negative stuff about the camera, I was ready to be under whelmed with its performance. I was surprised how much I liked it," Poroy said. "The image quality isn't quite what I'd hoped for from this long anticipated camera," said Mark J. Terrill of the Associated Press, "In real world and studio tests, I found that the D2H images shot using JPEG compression were noticeably soft and required the use of either high in-camera sharpening or a significant amount of sharpening in Photoshop." Shooting in RAW mode appears to remedy the problems photographers find in image sharpness with the JPEG files the D2H generates. "In tests shooting with the Raw + JPEG setting there was a clear difference in sharpness between the JPEG and the Raw image," said Terrill, "The Raw (file) was the clear winner. In contrast the same test done on a D1H and a D1X yielded little discernible difference between the Raw and JPEG. All tests were done using identical settings and sharpening turned off. As a result, I've been shooting everything in the RAW setting." But Southern California - based freelance photographer Rick Rickman countered, "The images seem very sharp to me. I normally don't have any sharpening turned on in the camera when I'm shooting but do that sharpening in the Photoshop process. I have to say personally this camera has reinvigorated my shooting confidence once again. I know that the images I'm producing are good and that's really all that matters to me." Kobe Bryant shot with the Nikon D2H at Staples Center. In spite of these concerns, all of the photographers Sports Shooter contacted for this story loved the camera, praising its design, handling, the improved autofocus, lack of shutter lag, great battery performance, sound recording feature and larger LCD monitor. "After the first half Rich (Addicks), who had edited and transmitted a few of my photos, suggested I switch to my D1H for my primary camera," said Gray, "He was shooting at 1250 and I was shooting at 800, his images were much cleaner and sharper. "I've since figured out that the camera is very sensitive to under-exposure and with the LCD screen being super bright, it's hard to judge exposure by looking at a preview. I turned the LCD to its dimmest setting, which makes it closer to accurate, and have been using more spot metering, I almost feel like I am slightly over-exposing images compared to how I shoot the D1H. This has helped the noise issue, but I still think it is more noisy than the D1H at higher ISOs." Despite this, Gray's overall opinion is "the D2H looks, feels and shoots great! Nikon has done a very good job with this camera and has solved many problems with previous Ds …"
"Nikon has delivered thousands of D2Hs into the worldwide marketplace and the response has been very positive," said Ronal Taniwaki, Nikon Professional Services branch manager, "We are very concerned however over several postings we've seen on the Sports Shooter site concerning excessive noise in the images. "We would urge our customers who are experiencing this noise issue to send the camera and a COPY of the original files on a CD to their nearest NPS service facility for evaluation." Freelance photographer and digital consultant Reed Hoffmann has another take on the quality issues, chalking up the complaints to possibly "pilot error". 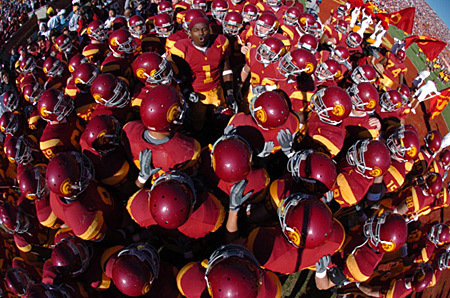 USC football team with the Nikon D2H. "I've heard and responded to a lot of complaints about the camera," Hoffmann said, "Most of the complaints come from one of two things: shooting the camera wrong ---wrong white balance, wrong exposure, wrong menu choices, etc. --- and unrealistic expectations concerning noise. All digital cameras have noise." Adding that noise is a fact of digital life and we have to "live with noise", Hoffmann also offered these solutions: "I shoot at the lowest ISO possible to keep noise minimal, make a good exposure to avoid making noise worse, and take steps to remove/reduce it when it shows up. I think that once people learn how to use the camera properly and spend some time with it, they'll come to appreciate what a fine camera it really is. Freelance photographer Rick Rickman also expressed some concerns on the noise levels of the D2H, but hasn't experienced problems as bad as others saying overall "I'm very please with this new camera." Added Rickman, "The noise issues are real. The images at ISO over 800 do have noise issues. However in the cameras I own, the noise is better than that of the D1H and as good as the D1X." Renown "digital guru" Rob Galbraith in his preliminary review of the D2H on his website observes that the feeling that the D2H is noisy might be a case of people latching onto Internet reports based on early bad images shot at camera store counters or made by pre-production models not indicative of the camera's real capabilities. K.J. 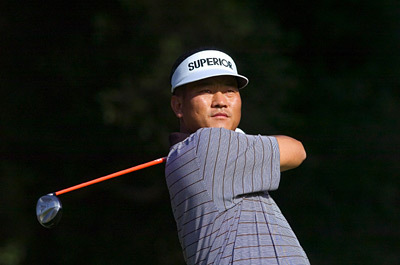 Choi tees off on the sixth hole during the third round of the Target World Challenge, Dec. 13, 2003. This was shot Raw with 300 2.8 at 250 ISO and shot at 1/2500 at 5.6. "A lot of noise has been made about the noise from the D2H. Much of the hand-wringing has been prompted by the posting of camera store and trade show happy snaps, which have really demonstrated only that the D2H will faithfully record certain scenes in all their poorly-shot glory," wrote Galbraith. In helping Sports Shooter prepare this article, Terrill did extensive testing of his own with regards to photographers' perceptions of problems with the D2H's image quality. "Another image quality disappointment is the noise. I realize others have had great experiences in this area. I have not. While in some situations the image noise above 500 ISO is equal or better than the D1H, in many others the noise is worse. It isn't so much the amount of noise, but the quality of it. 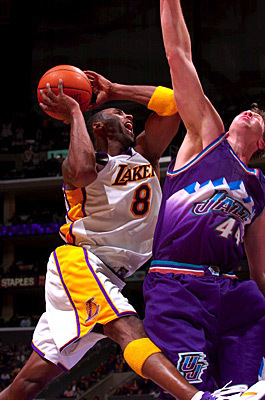 In some situations the noise has a clumpy red or purple look to it, which was quite noticeable at Lakers games. Some people feel that this may be an infrared problem. Do I need to dig through my attic looking for my old NC2000 Hot Mirror filters? I hope not." "The noise even rears its ugly head at 250 ISO. I was shooting a golf tournament last week and shot a golfer teeing off against an almost black background. 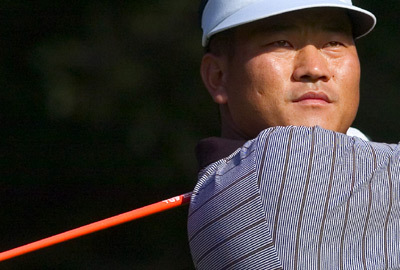 The image, which was perfectly exposed for the golfer, exhibited an unacceptable amount of noise in the blacks as if I had shot it at 1250 ISO. I took a look at images shot last year on the same tee and the same basic exposure with a D1H and found there to be quite a bit less noise. This sort of situation is rare, however. Most of the time the D2H performs well in daylight situations. In any case the noise at high and low ISO seems to clean up well using third party software, but this shouldn't be necessary in a brand new state-of-the-art camera. "On the other hand, I shot the American Music Awards with an incandescent white balance setting at 1000 ISO and felt that the camera performed quite well. In this case the noise wasn't clumpy at all. The saturation also seems to drop as you go up in ISO. Go figure." Tighter version showing noise in dark area. This was shot Raw with 300 2.8 at 250 ISO and shot at 1/2500 at 5.6. "Using the cameras at my first Packer game was really exciting, "said Steve Apps of the Wisconsin State Journal, "I only had the two batteries in the cameras so I was a bit nervous on their shooting life. I was really impressed. The one battery powered the 400mm 2.8 for the whole game with considerable reviewing and deleting. I still had 60% power left. Not bad for a cold weather Packer game. If the battery power lasts it will lighten up my traveling case." Sports Illustrated's Robert Beck, who was using primarily Canon equipment the past couple of years said, "As for how the camera works in the field, it is very good. The autofocus is now as good as any out there. There are times when it searches a bit but no more or no less than the other guys. "The batteries are fabulous. They last over two games without a change. Probably more but I just recharge them (there is no harm in that) and start over after a couple of games. The motordrive is fast. I can get many more frames (when not on strobes obviously) of critical plays in sequence and I can shoot longer bursts without the buffer running out so quickly (this is shooting raw and jpg at the same time)." Terrill says his personal tests clock the D2H's motordrive slightly faster than advertised. "The motor drive in my tests is actually better than advertised." Terrill said, "I achieved 8.5 frames per second verses Nikon's claim of 8." Both Beck and Terrill commented they felt the autofocus vastly improved over its predecessor. "The auto focus is also improved. I shot a 25-frame sequence of a quarterback getting sacked, the ball popping loose and the defender running in 75 yards for a touchdown. Every frame was sharp," Terrill said. This cropped image of Nicole Kidman was shot at JPEG Fine with a setting of Sharpen Med High at 400 ISO with a 70-200 2.8 at 1/160 of a second at f4. The file was also sharpened further in Photoshop. However Apps was not as impressed with the D2H's autofocus performance, calling it a "disappointment." "I don't think it is any worse than the D1," Apps said, "But I know it isn't any better. In the two Packer games I have shot I have seen it focus on things I didn't intend it to focus on. One play in Packers verses Bears there was a pass to the end zone. I was using a 70-200 zoom and the play folded out in front of me. As I said before, the 8 frames gave me a lot to choose from, but the best frame was just not sharp. I had to use the next one." performance that just plain works, reliably all the time --- when's the last time you could say that about a digital camera?" So is the D2H the camera Nikon users have been holding their collective breath for that would leapfrog them over their Canon using colleagues? Or is the D2H a problematic piece of hardware that was rushed into release before it was ready? Mark Terrill has the last word on this: "While I'm disappointed that Nikon would put out a camera with these flaws, I think they deserve a chance to rectify the situation. I'm also not convinced that every D2H put into the pipeline is exhibiting these problems. There are just too many people that absolutely love their cameras and have no complaints at all."